The DCB PSU Poll Sharing Unit makes it possible to share up to four polling host computers to as many as four different device ports, connecting to four or more different networks. Networks can be private line, phone company lines, wireless networks, or any combination of networks. The Poll Sharing Unit uses RTS/CTS or buffering and timeouts to resolve contention between the multiple host computers. The DCB Poll Sharing Unit has four Host ports and four Device ports and optional modem for host port backup. Each port can be set to a different speed, from 1200 to 38,400 bps (port to port speed conversion). The ports are RS232 async. RS422 port interface converters are available. 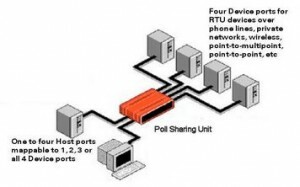 Polls coming into a Host port are sent out one or more of the four Device ports, mapped by the user on a per port basis. For example, polls coming in Host port 1 may be mapped to all 4 Device ports, while on Host ports 2, 3 and 4, data is mapped to a single Device port. The Poll Sharing Unit has a per Host port poll timeout and a per Host port inter-message timeout. Polling data coming in a Host port is sent to the selected Device port(s). Any polls coming in on other Host ports are buffered until the first poll out is answered or after the poll timeout expires. Only one Host port at a time may send a poll out a Device port. Another method of selecting ports is using RTS/CTS RS-232 control leads on the Host ports. The PSU constantly scans all ports for Request to Send (RTS). When RTS is asserted on the Host port, the Poll Sharing Unit returns CTS to the host computer, allowing it to send out a poll. The poll is sent out the mapped Device ports. No other Host computer port will get CTS from the Poll Sharing Unit until the first Host port gets a poll response back from a Device port, or the poll timeout expires. Setup via the rear panel setup port. Use setup port to define port speeds, mapping, etc. we recommend that you discuss your application with one of our technical sales people before ordering.